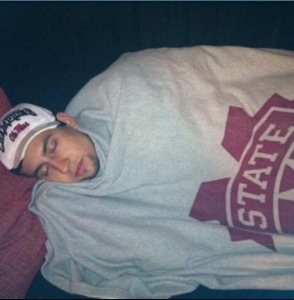 Mississippi State made headlines today punching their ticket to Omaha and many fans and athletes including Marshall Henderson (yes the crazy,landsharking, 3-point shooting madman) sent out congratulations over social media. You read that right. The lightening rod of controversy, often known for his on-court antics, made a very classy move after game 2 concluded. Tweeting pleasantries to your arch rival is quite the move. I know a lot of MSU fans have had a lot of hate for Marshall. I’ve been consistent in how I felt about him. I’ve always thought he was fun to watch but needed to mature and I never came down hard on him as a person. I thought his tweet yesterday was refreshing and is perhaps a sign of his maturation. I’ve always said the first step in being a grown man is to learn to take responsibility for ones actions and learn from them. At the conclusion of the Rebel’s season, Marshall wrote a letter to Ole Miss fans apologizing for some of his antics and vowing to be a leader in 2014. When it was released, many fans were still skeptical of the sincerity but I must say that he has been a bit different since he wrote that. Rivalry aside, I’m a guy that roots for people to better themselves especially when they handle themselves with class. I like what I’m seeing from Marshall and Ole Miss fans should too. He has a chance to really be a positive ambassador for Ole Miss with his new mindset. This entry was posted in Sports and tagged Basketball, Ole Miss, SEC. Bookmark the permalink.